Have your plants taken over? Are your shrubs looking sad and neglected? Do you need help getting your garden under control? Yorkshire Gardeners is here to help. I specialise in garden makeovers by carefully restoring gardens to their full potential through correct pruning techniques, soil improvement, plant division and new planting. 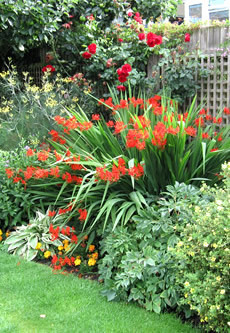 I also advise on planting new beds and borders from drawing up plans to sourcing plants from local nurseries. I have a lifetime love of gardening, starting with my father’s amazing garden in Wetherby, through the window boxes in my first London flat to the challenge of planting in the foothills of the French Alps. I settled in North Yorkshire over a decade ago and fell in love with the range of wonderful gardens in the area from Harlow Carr and Newby Hall to the smaller gardens of York Gate and Littlethorpe Manor. I started working in private gardens around Ripon in 2010. In 2014 went to Askham Bryan College to study for the Royal Horticultural Society’s Diploma in Horticulture. I am now qualified at RHS Level 3 in practical horticulture, plant health and nutrition, propagation and garden planning, construction and planting . I have taken additional courses in winter garden maintenance, pruning and garden design based at Harlow Carr, Newby Hall and other regional gardens. I work closely with my clients, ensuring that the restoration is a happy and productive experience for all parties. Once the garden is restored to the client’s approval I can recommend a local gardener to continue regular garden maintenance. Contact us for a free garden visit and assessment. Yorkshire Gardeners has full public liability insurance .